03:55:00 Makes 16 servings, 1 pop (85 g) each. Makes 16 servings, 1 pop (85 g) each. 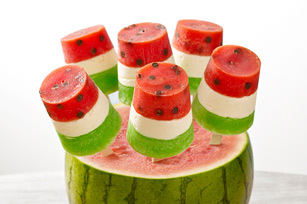 Slide into summer with our wonderful Watermelon Pops. Layers of JELL-O and a creamy centre create fruity frozen no-drip pops. Mix 1/3 cup sugar and lime jelly powder in medium bowl. Add 1 cup boiling water; stir 2 min. until completely dissolved. Add enough ice to 1/2 cup cold water to measure 3/4 cup. Add to lime jelly; stir until ice is completely melted. Refrigerate 25 min. Meanwhile, repeat with remaining strawberry jelly powder but do not refrigerate. Pour into 16 (3-oz.) paper cups. Freeze 20 min. Stir 1/2 tsp. chocolate chips into gelatin in each cup. Beat cream cheese and remaining sugar with mixer in medium bowl until blended. Stir in Cool Whip; spread over jelly in cups. Cover with lime jelly. Insert wooden pop stick in centre of each cup for handle. Freeze 3 hours or until firm. Remove pops from cups just before serving. Serving Size Makes 16 servings, 1 pop (85 g) each.